Happy New Year's Eve! Bye, Bye '06! Don't Let the Door Hit You on the Way Out! Written on 7:51 PM by Jack B.
I hope everyone celebrates the coming new year in style (don't drink too much though - I'll do that for both of us *Ha, Ha*) and has a wonderful 2007! And a Happy Eid to Muslims everywhere as well. Posted in holidays | Comment Now! Written on 7:46 PM by Jack B. A Happy and Joyous Christmas to Everyone! Written on 2:22 PM by Jack B. But is it really Christmas? Have a very Happy, Holy Day! Posted in art, holidays, poetry | Comment Now! Written on 7:39 PM by Jack B. It's not that far off, you know. Yeah I know Christmas trees are basically some pagan tradition from Germany co-opted for the holiday season but I love them anyway. Christmas isn't Christmas, if there's no tree. 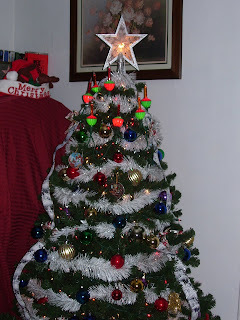 Here's a picture of this year's Christmas Tree 2006 at my home: No angel at the top this year and no flashing lights nor the chirping bird noises usually put into the tree. But it's not that bad - and my sister did it anyway, so I take no responsibility. I'm too lazy to do anything but throw tinsel around. Ha, ha. Written on 10:07 PM by Jack B. Written on 10:31 AM by Jack B. Written on 11:25 AM by Jack B.